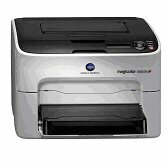 Konica Minolta has just launched is smallest color laser printer the magicolor 1650EN. This new compact printer not only produces high quality laser printouts but also is extraordinarily quiet. It comes in three flexible configurations with full network compatibility making this an ideal solution for home or small offices. Equipped with the Emperon print controller for straightforward integration into any network – Windows, Mac or Linux – the magicolor 1650EN is compatible with common printer protocols such as PCL and PostScript (PS). The secret behind the outstanding print quality is Konica Minolta’s state-of-the-art printing technology. Konica Minolta’s Simitri HD toner takes credit for crisp texts as well as bright and UV light resistant, long-lasting colors. Designed with the user in mind, the color laser printer is available in three different configurations, from a standard model to the duplex model magicolor 1650EN-d. The magicolor 1650EN-d comes with a standard duplex unit plus a lower paper feeder for additional paper supply making this the ideal solution for those that print regular large print jobs. All models come with 256 MB of memory and provide page output of pages per minute for 5 color prints and 20 pages per minute for black and white prints. The printers can handle plain paper with formats up to A4 as reliably as thick paper of up to 209 gsm, labels, postcards and envelopes. The magicolor 1650EN has been designed to be used easily and to be operated in a straightforward way. Via an LCD display and just a few self-explanatory buttons on the printer’s front side, the printer can be operated without any fuss. As soon as a cartridge needs replacing or the printer requires attention, users are informed of this right at their PC via PageScope Web Connection. Via Konica Minolta’s Clean Planet Programme, used cartridges can be recycled to 99%. The Simitri HD toner requires lower fusing temperatures than conventional toners. As a consequence, users can save up to 15% of the energy required for printing. Furthermore, CO2, SO2 and NO2 emissions generated by Simitri HD toner are about 40% below conventional toner. This entry was posted on Monday, December 22nd, 2008 at 1:36 pm	and is filed under Konica Minolta, laser, printer. "Survey Finds Office Workers Need Easier-to-Use Printers and MFPs"
"A Typeface That Saves Ink"